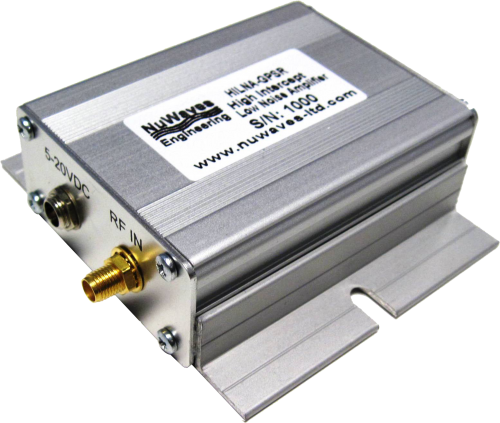 This high-performance module delivers 32 dB of gain across the frequency range of 1200 MHz to 1600 MHz with an OIP3 of +30 dBm and less than 1 dB of noise figure. The HILNA GPS is also usable up to 2000 MHz with 28 dB of gain (typical). NuWaves’ HILNA GPS™ is a broadband low noise amplifier designed to achieve high gain while maintaining low noise and a high third order intercept point specifically for L1 (1575.43 MHz) and L2 (1227.6 MHz) GPS signals. The HILNA GPS’s robust power supply also operates over a very broad range easily allowing the unit to be integrated into systems without regard to power supply precision.